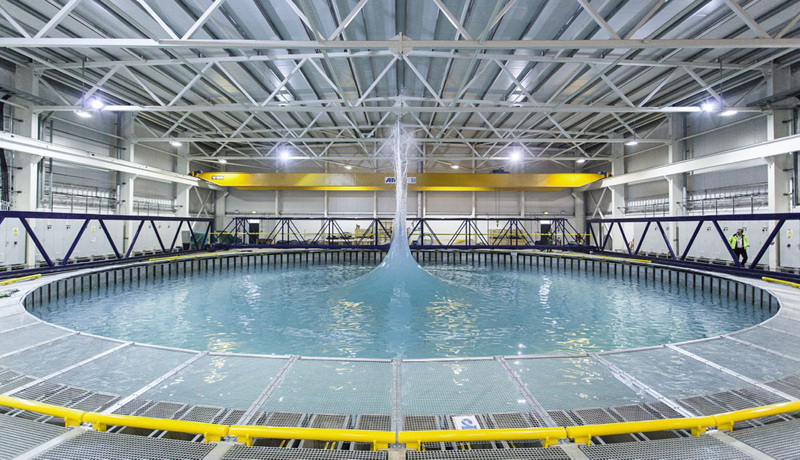 The circular wave tank is 25 metres across, five metres deep and contains 2.4 million litres of water that can be used to simulate scale version of waves up to 28 metres high. Submerged flow-drive units can simultaneously and independently drive current across the tank in any relative direction at equivalents of up to 14 knots. The wave tank can be used to recreate waves and currents at 1/20th scale from coastlines around the UK, Europe and beyond, allowing researchers to develop and refine full-scale devices such as wave and tidal energy converters, floating offshore wind platforms, and vessels to install and maintain offshore projects. The £9.5m FloWave Ocean Energy Research Facility was funded by the Engineering and Physical Sciences Research Council (EPSRC) and Edinburgh University, and is managed by University subsidiary company FloWave TT Ltd.
BBC News Article: "Spectacular wave tank opens in Edinburgh"
Edinburgh University News Article: "Test tank makes waves in marine energy"